Milford Music Center always has a large selection of sheet music, lesson books, popular song books, and much more. Popular publishers such as Alfred, Faber & Faber, Glover, Bastien, and Hal Leonard just to name a few. If you don't see what you like, we will be happy to special order it for you. Milford Music Center is stocked full of grands, uprights, digital pianos, keyboard, guitars, violin, woodwinds, brass accessories, band instruments. We recommend Private lessons for our students. Private lessons are usually comprised of a 30 minute lesson, however, we do offer 1 hour lessons for our advanced students. Our teachers have bachelors degrees, advanced studies and more. We have many beginners for all instruments and our lessons are provided to fit the student. Milford Music Center believes in providing a learning process that fits all ages especially the young children of our community. We recommend group lessons for adult students. 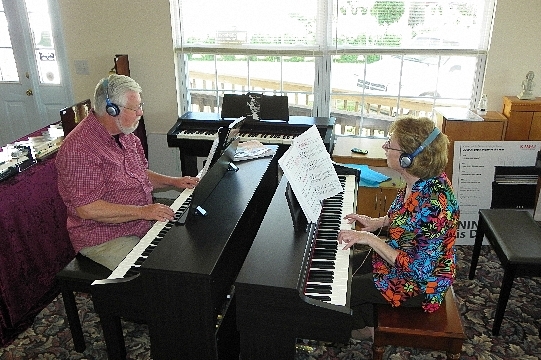 We have been teaching people around the Delmarva peninsula to play the piano for over 25 years. 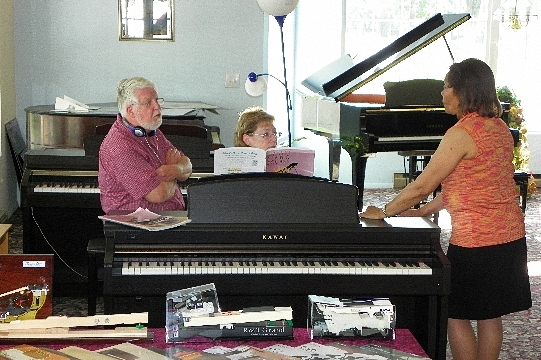 Students naturally learn and benefit from one another in our group piano lessons. Call today for more information on our private piano lesson programs at Milford Music Center. Numerous studies have concluded that children who play an instrument score higher on both standard and spatial cognitive development tests alike. Kids who play piano, in particular, scored higher in math, especially on problems dealing with ratios and fractions. When parents set aside that special time to be with their child during lessons and practice time, children feel special. When loving praise is given often from parent and teacher, a child feels great about the work they have put in, and motivated to do more. Learning to play the piano is hard work and takes dedication. Not only does each song mastered increase a child’s self-esteem, but showcasing their newly learned talents can boost their self-esteem as much as winning a game in a sports competition. Playing the piano develops many aspects of coordination: eye-hand coordination, fine motor skills, ambidexterity, and independence of the hands. This is especially true when both hands are doing two different things at the same time – one playing loud the other soft, one playing staccato and the other legato, one hand playing chords and the other playing a melody, etc. Learning a piece of music takes a great deal of focus, causing a child to interpret a note and a rhythm and then translate it into hand movements on the keyboard. The longer the piece, the more concentration is developed. Playing and reading music allows them to think both critically and creatively, which is a skill that will assist them in anything they choose to undertake in the future. A piano student participates in various music performances like a recital, or piano competition. The student learns to deal with racing heartbeats, fingers trembling, anxiety, and lack of focus in an effort to control one’s nerves. Participation in these performances will eventually help a child to be able to handle stress with poise and grace. 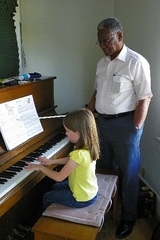 One of the most important benefits of piano lessons is the value of hard work and perseverance in long-term goals. The perception that not everything in life is instantaneous is a lesson worth learning! Piano students learn that little steps today actually prepare them for the future. Students recognize that as they advance from one level to the next level, they are not only getting better but enjoying piano playing as well. In a teenager’s life, especially in moments when they want something intensely, their minds will be distracted from the route of immediate or short-term gratification. Hard work will ultimately usher them back to their long-term goals. It is no wonder, that most of the major classical composers like Bach, Beethoven, Brahms, and Mozart chose the piano as their primary instrument. Because one is able to play many notes at the same time, the piano is a wonderful tool for composing symphonies, quartets, and other works where the melody and harmony can be played simultaneously. In addition, because the piano is both a stringed instrument and a percussive instrument, many different timbres of sound can be produced on a piano. Playing the piano involves interplay of both right and left-brain activity that stimulates neural development. Whether it’s a rock band or a music theory class, learning the piano is a foundation for all future music endeavors. In addition, the skills and knowledge they learn in piano helps them easily pick up another musical instrument. Regardless of whether a child plays the piano for a short time or for a lifetime, the long-term effects of their piano pursuance are many. They are developing a skill that will last them their whole life long. I have heard stories of elderly people who are unable to walk, but who sit in front of a piano and can play perfectly. Your children may not turn out to be concert pianists, but they may become doctors, lawyers, entrepreneurs, engineers, writers, and teachers… because they have been provided immeasurable opportunities to develop essential life skills. The overall benefit of piano studies is not even about music itself. It is about becoming a fine person. Attention Parents: Your Gift to Your Child! much as winning a game in a sports competition. coordination, fine motor skills, ambidexterity, and independence of the hands. This is especially true when both hands are doing two different things at the same time – one playing loud the other soft, one playing staccato and the other legato, one hand playing chords and the other playing a melody, etc. is instantaneous is a lesson worth learning! Piano students learn that little steps today actually prepare them for the future. Students recognize that as they advance from one level to the next level, they are not only getting better but enjoying piano playing as well. In a teenager’s life, especially in moments when they want something intensely, their minds will be distracted from the route of immediate or short-term gratification. Hard work will ultimately usher them back to their long-term goals. Beethoven, Brahms, and Mozart chose the piano as their primary instrument. Because one is able to play many notes at the same time, the piano is a wonderful tool for composing symphonies, quartets, and other works where the melody and harmony can be played simultaneously. In addition, because the piano is both a stringed instrument and a percussive instrument, many different timbres of sound can be produced on a piano. from Springfield, MO play Duke Ellington's "Take the A Train"
from their album "Beepers Off"
What are Springfield, Missouri doctors doing in their "spare" time? Playing big band music! To be more exact, 15 physicians and two medical administrators get together for a weekly evening practice. For many of them, this may be at the end of a 14 our workday. The genesis of this group was the need for some entertainment at the annual Smith-Glynn-Calloway Clinic employee's Christmas party. Dr. Rod Geter and Dr. Joel Waxman came up with the idea of a band. Among 80 physicians on the clinic staff, there were enough musicians to form a 14 piece band. Dr. Mike Wooten, of the trumpet section, commented after the first performance: "the best thing we did was play real loud." Other performances soon followed: One at a nursing home and another at a World War II block party benefit for the Heart Association. The group was initially conducted by Dr. Rod Geter until Dan Palen of Palen Music Store, agreed to become the musical director. Due to the nature of the medical practice and because band members cannot always be where they're supposed to be at a specified time, there are backup players for many of the positions in the band. One of the complications of rehearsals is the beeping of pagers -- an unavoidable interruption. Just what benefits are there for the members of the group? For one thing, it's just plain fun to play the music of the big band era. In a medical community the size of Springfield, these doctors might otherwise not have the chance to be acquainted with each other if not through the common bond of their love for music. *ca·du·ce·us (k-ds-s, -shs, -dy-)n. pl. ca·du·ce·i (-s-)1.a. A herald's wand or staff, especially in ancient times.b. Greek Mythology A winged staff with two serpents twined around it, carried by Hermes.2. An insignia modeled on Hermes's staff and used as the symbol of the medical profession. [Latin cdceus, alteration of Greek dialectal krkeion, from krx, herald. ]ca·duce·an (-s-n, -shn) adj.